Several football clubs tried to catch out their supporters on April Fool's Day - but one of the more remarkable stories to appear is in fact true. 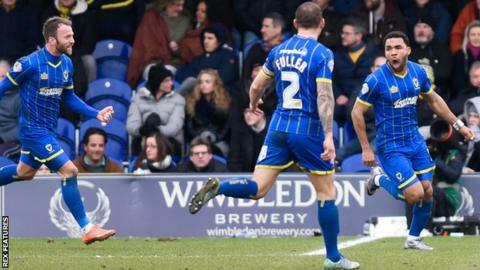 AFC Wimbledon are set for the big screen, having reached agreement with Hollywood studio Fox 2000 for a film to be made about the club. The Dons' story will be retold from its formation in 2002, when it held trials on Wimbledon Common. The phoenix club, founded by supporters after the old Wimbledon FC was given permission to relocate to Milton Keynes, reached the Football League in 2011 following five promotions in nine years. American author John Green, who sponsors a stand at the Cherry Red Records Stadium, will co-produce the film. "AFC Wimbledon isn't just one of the best underdog stories in sports history; it's also a story about a community that fought the injustice of the Milton Keynes debacle and is now fighting to have a stadium back in Wimbledon," Green told the club website. The film is in the early stages of development, with no script yet written or schedule for release. However, Matthew Breach, chair of the Dons Trust which owns the club, said the deal was "a fantastic opportunity to tell a great story". With the Dons currently 10th in League Two and attempting to reach the play-offs, it is not yet known whether the likes of manager Neal Ardley or striker Adebayo 'The Beast' Akinfenwa will have roles in the film. So the prospect of a Dons movie is fact, not fiction. But the same could not be said of the imaginative lines appearing on social media and club websites on Friday morning. Southampton were straight out of the blocks, informing fans they would be introducing a new club crest this summer. There would be one minor change to their current badge - replacing the halo-topped football at the top of their badge with an angel-face emoji. Meanwhile, Arsenal claimed they would be installing a retractable sunroof at the Emirates and Championship club Bristol City said 6ft 5in defender Aden Flint had signed a dual-registration deal with local basketball side Bristol Flyers. But perhaps best of all saw Hartlepool United announcing that the Football Association had given them permission to play in fancy dress on the final day of the season.